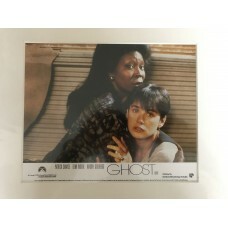 Ghost is a 1990 American romantic fantasy thriller film starring Patrick Swayze, Demi Moore, Whoopi Goldberg, Tony Goldwyn, and Rick Aviles. It was written by Bruce Joel Rubin and directed by Jerry Zucker. 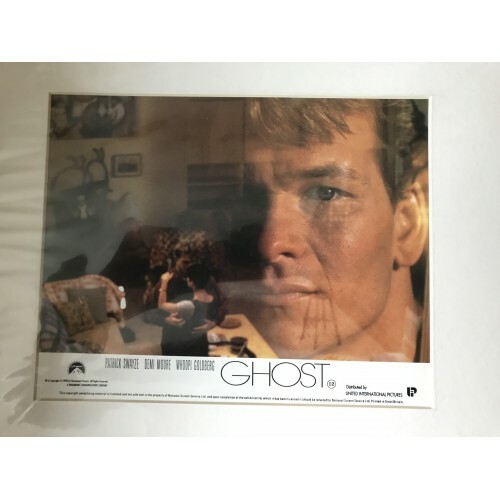 The plot centers on a young woman in jeopardy (Moore), the ghost of her murdered lover (Swayze) and a reluctant psychic (Goldberg) who assists him in saving her although the psychic had previously been faking her powers. The film was an outstanding commercial success, grossing over $505.7 million at the box office on a budget of $22 million. 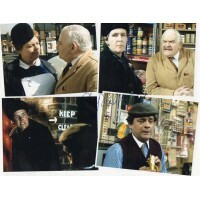 It was the highest-grossing film of 1990. 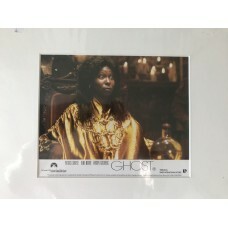 Adjusted for inflation, as of 2015 Ghost was the 93rd-highest-grossing film of all time domestically. 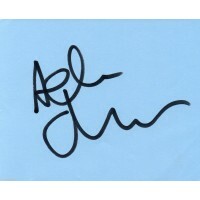 The film was nominated for five Academy Awards, including Best Picture, Best Score and Best Film Editing. 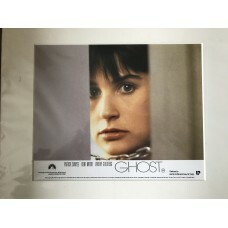 It won the awards for Best Supporting Actress for Goldberg and Best Original Screenplay for Bruce Joel Rubin. 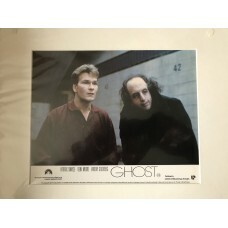 Swayze and Moore both received Golden Globe Award nominations for their performances, while Goldberg won the BAFTA, Golden Globe, and Saturn Awards in addition to the Oscar. 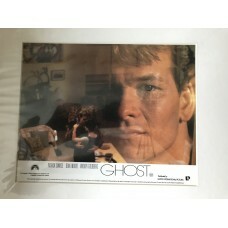 Ghost - Original Mounted Lobby Card 1990 - 1Original 10x8 Lobby Card - Mounted in a 14x12 Inch Mount - Ready For Framing!Marks, light and shadows on p..
Ghost - Original Mounted Lobby Card 1990 - 2Original 10x8 Lobby Card - Mounted in a 14x12 Inch Mount - Ready For Framing!Marks, light and shadows on p..
Ghost - Original Mounted Lobby Card 1990 - 3Original 10x8 Lobby Card - Mounted in a 14x12 Inch Mount - Ready For Framing!Marks, light and shadows on p..
Ghost - Original Mounted Lobby Card 1990 - 4Original 10x8 Lobby Card - Mounted in a 14x12 Inch Mount - Ready For Framing!Marks, light and shadows on p..
Ghost - Original Mounted Lobby Card 1990 - 5Original 10x8 Lobby Card - Mounted in a 15x13 Inch Mount - Ready For Framing!Marks, light and shadows on p..